Maria Bennett is a San Francisco Bay Area - based painter. She received a BA in physiology from UC Berkeley, an MS from Harvard School of Public Health and a PhD in Cell Biology from Harvard University. While pursuing a science career, she continued to study painting as well as produce traditional harpsichord soundboard paintings in the 17th century Flemish and 18th cen﻿tury French style. 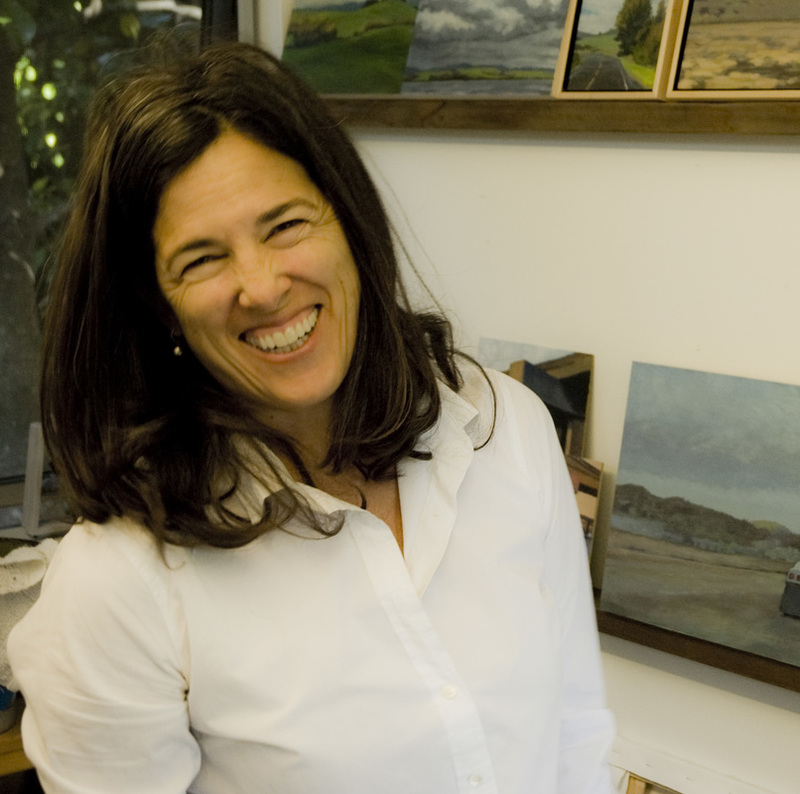 Since returning to California, her work has focused on the landscape. I am interested in what’s happening on and around the roads as I travel around the Bay Area. The cloud formations this past spring have been a spectacular backdrop for the explosion of fleeting green on the soft hills, and a contrast to the vertical punctuation of palm trees and telephone poles. Canary Island date palms are ubiquitous in California, having been planted in great numbers in the early part of the 20th century. They are often the only remnant of what had been a fine home or elegant street, and I am captivated by their seemingly random appearances on the side of our now expanded freeways, or tucked between older buildings. These recent paintings invite you to see what I’ve been noticing: the contrast between the untethered clouds and our human efforts to alter the landscape. In my Tomales Bay work, the figure in the form of a bather has appeared, and I’m enjoying depicting these swimmers at the moment in between- are they going to dive in or are they coming out? This work is painted on paper covered boards, or birch plywood, which provides a warm and textured background that helps to convey the muted soft tones of summer in West Marin.